Over the past few months, Audrey Watters, Dan Meyer, and Keith Devlin have been critical of Silicon Valley, edtech startups, and iPad textbooks which hope to “disrupt” education. In my opinion, the real stumbling block to meaningful change is students’ formal reasoning skills — analytical thinking that cannot be cultivated by pausing and rewinding video or playing Math Blasters. Many of our students are transitioning from concrete to formal reasoning. A significant barrier to learning for understanding is students’ own formal reasoning skills. Formal reasoning skills (and thus learning for understanding) can be developing when instruction is structured around the Learning Cycle. Silicon Valley and edtech startups have been focusing on (often inappropriately) just a small fraction of the learning cycle. My Challenge to Silicon Valley: Help students learn for understanding by innovating around the rest of the learning cycle. 1. Many of our students are transitioning from concrete to formal reasoning. 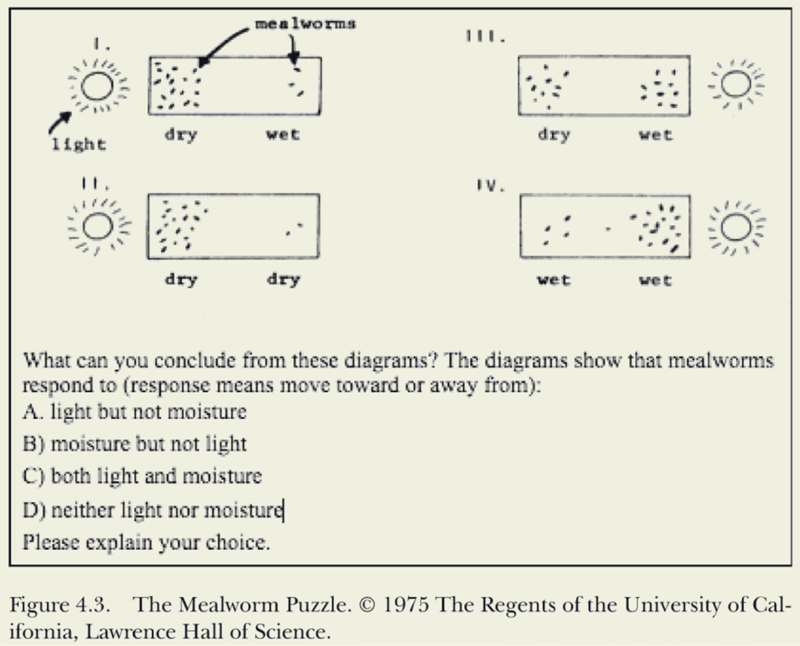 Below are 3 reasoning puzzles, each followed by a video of college students attempting to solve the puzzle while explaining and discussing their logic. It’s a highly illuminating look at students’ reasoning processes. 2. A significant barrier to learning for understanding is students’ own formal reasoning skills. You’re probably thinking, “So, what? 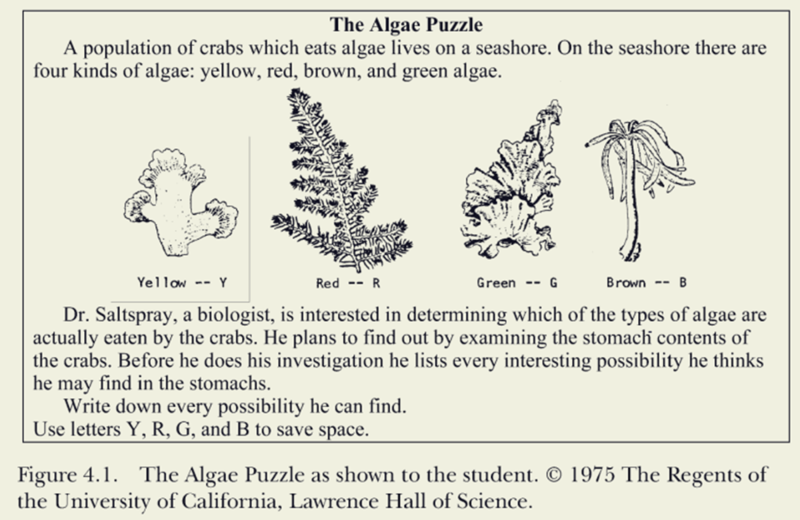 Just because Johnny can’t figure out all the possible combinations of algae doesn’t mean he can’t learn physics.” But the research strongly suggests that it does, even in interactive engagement classes. As you can see, interactive engagement course outperformed traditional courses in learning gains as measured by the Force Concept Inventory (FCI). The FCI is the most widely used test of physics understanding. But why is there such a wide range of FCI gains among the IE courses and (not shown) among the individual students within a particular course? A study entitled “Why You Should Measure Your Students’ Reasoning Ability” (Coletta, Phillips, and Steiner) suggests reasoning ability is strongly correlated with physics success. The data were split into quartiles based on the Lawson scores. 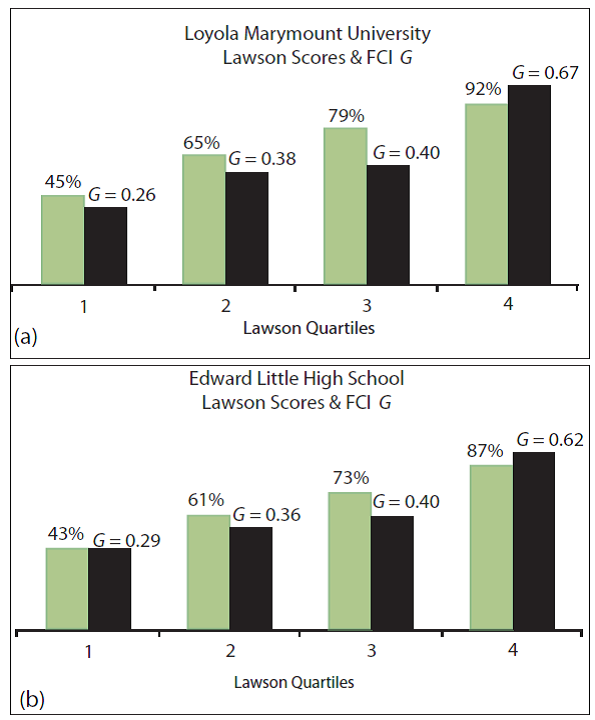 The light green bars represent the average Lawson test score for each quartile and the dark green bars represent the average FCI gain for each quartile. There is clear correlation between reasoning ability and learning gains in physics. I’d wager this correlation extends to other subjects as well. 3. Formal reasoning skills (and thus learning for understanding) can be developed when instruction is structured around the Learning Cycle. According to Piaget, intellectual growth happens through self-regulation — a process in which a person actively searches for relationships and patterns to resolve contradictions and to bring coherence to a new set of experiences. EXPLORATION: The students learn through their own actions and reactions in a new situation. In this phase they explore new materials and new ideas with minimal guidance or expectation of specific accomplishments. The new experience should raise questions that they cannot answer with their accustomed patterns of reasoning. Having made an effort that was not completely successful, the students will be ready for self-regulation. INVENTION: Starts with the invention of a new concept or principle that leads the students to apply new patterns of reasoning to their experiences. The concept can be invented in class discussion, based on the exploration activity and later re-emphasized by the teacher, the textbook, a film, or another medium. This step, which aids in self-regulation, should always follow EXPLORATION and relate to the EXPLORATION activities. Students should be encouraged to develop as much of a new reasoning pattern as possible before it is explained to the class. APPLICATION: The students apply the new concept and/or reasoning pattern to additional examples. The APPLICATION phase is necessary to extend the range of applicability of the new concept. APPLICATION provides additional time and experiences for self-regulation and stabilizing the new reasoning patterns. Without a number and variety of APPLICATIONs, the concept’s meaning will remain restricted to the examples used during its definition. Many students may fail to abstract it from its concrete examples or generalize it to other situations. 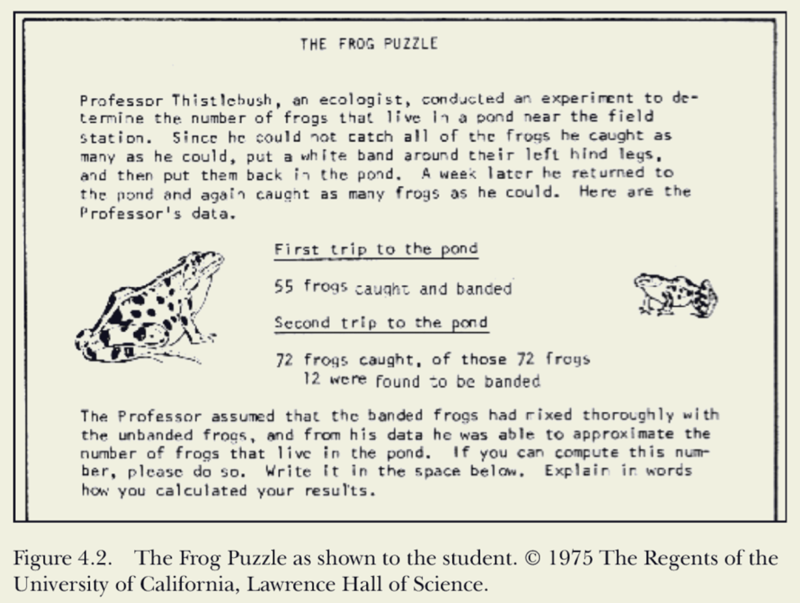 In addition, APPLICATION activities aid students whose conceptual reorganization takes place more slowly than average, or who did not adequately relate the teacher’s original explanation to their experiences. Individual conferences with these students to help identify and resolve their difficulties are especially helpful. 4. Silicon Valley and edtech startups have been focusing on (often inappropriately) just a small fraction of the learning cycle. Unfortunately, Silicon Valley has been dumping its disruptive dollars almost solely into the INVENTION phase and on the tail-end of the phase at that. It views education purely as a content consumption process and ignores the development of formal thinking and reasoning. Remember, in the invention phase, “The concept can be invented in class discussion, based on the exploration activity and later re-emphasized by the teacher, the textbook, film, or another medium.” That’s Khan Academy videos, flipclass videos, iBooks, an similar technologies designed to present content via direct instruction. However, “Students should be encouraged to develop as much of a new reasoning pattern as possible before it is explained to the class.” Which means that this type of direct instruction should be as minimal as possible, because it robs kids from reasoning and making meaning. In other words, Silicon Valley is putting its energy into the portion of the invention phase that should be as small as possible! Now let’s look at the application phase. There has been some development here as well, most notably in apps and exercise software which seek to gamify the classroom. But the application phase isn’t about getting 10 right answers in a row or solving problems to shoot aliens. Remember, “Without a number and variety of APPLICATIONs, the concept’s meaning will remain restricted to the examples used during its definition.“ Real learning with understanding means students can reason about the concepts well enough to use them in new and unique concepts (aka transfer). Applications should require students to examine their own thinking, make comparisons, and raise questions. Great applications examples are open-ended problems, problems which present a paradox, and student reflection on both successful and unsuccessful problem-solving methods. Deep learning does not end when the Application phase begins. 5. My Challenge to Silicon Valley: Help students learn for understanding by innovating around the rest of the learning cycle. Real disruption isn’t going to come from skill and drill apps, self-paced learning, badges, YouTube videos, socially-infused learning management systems, or electronic textbooks. Students must be continuously engaged in the learning cycle. We need to equip our students with the reasoning skills to learn how to learn anything. Focus on experiences in the exploration phase, meaningful sense making in the invention phase, and worthy problems in the application phase. But, in reality, we only have ourselves to blame. It shouldn’t come as a surprise to us when students can’t think — the status-quo in education has been to spend most of our time on content delivery while robbing students of exploring and reasoning opportunities. And current edtech trends aren’t fixing this problem; rather, they are making it easier to make the problem worse. To be fair, a few “good disrutptions” have occurred in the other phases of the learning cycle. Motion detectors allow students to “walk a graph” so they can easily explore position-time and velocity-time graphs. GeoGebra allows students to explore and play with geometry and functions quickly and easily. PhET simulations allows students to conduct open-ended planetary orbit experiments that would be impossible in real life. And VPython programming gets students to apply what they learned to write their own simulations and visualizations. So when presented with the next great edtech “disruption,” ask yourself: has this innovation actually changed how student think about math and science concepts? Or has it just allowed students to get a few more questions correct on the state exam? This entry was posted in Uncategorized and tagged flipping, inquiry, Khan Academy, physics education research, teaching, technology. Bookmark the permalink. Math is first taught concretely, and the student moves into symbols after gaining the deep understanding through puzzles/games. In general, though, I agreed about Silicon Valley reinventing the wheel. I would hasten to add that Silicon Valley is only interested in making money, so they will produce what makes money. In the educational market, right now, mostly that’s drill and kill and slick multi-media products that are basically just books with video. As long as schools and teachers are evaluated on standardized test scores, that’s not likely to change. What school district is going to invest in any product that increases reasoning skills? That is not tested on the tests that matter to schools most. Just look at the examples you have given of technologies that address other parts of the learning cycle. How commercially driven are they? Unless I’m mistaken, nobody is collecting profit from PhET or VPython. For that matter, nobody really profits from anything discovered by PER or any of the legitimate research done in other subject areas. The research seems to pointing in the direction that real education, the kind that is addressed by the entire learning cycle, involves qualified teachers interacting with students. Unfortunately, that is almost in direct contradiction to the goals of those for-profit interests who are controlling the creation of current educational policy. Sal Kahn “teaching” millions of kids as they are monitored by minimum wage behavior cops is the way to generate profit in a privatized educational market, so that is probably what will happen. A few kids lucky enough to be born into wealthy households will get the benefit of real teachers who have the luxury of worrying about such niceties as reasoning skills. Everyone else gets conditioned for their mindless working lives by doing mindless schoolwork. This is turning into quite a rant. It’s been a tough week and I should just stop here and go home. That’s exactly what Sal, et al. want to flip; when the teacher explanation occurs in the learning cycle. With much due respect Christopher, the point is that the teacher explanation should be minimal. Ideally, it wouldn’t even be necessary. Most flip classrooms I read about just put the teacher explanation online, so the kids can do homework (low level Application?) in class. When teacher explanation is needed, it needs to tie back directly to the exploration activities and student experiences. This means teacher explanations will likely need to change each year because each group of students is different. This is completely different from what Khan and most other flippers are doing when making video — they record them once to use in successive years. Another point I was trying to make is that the teacher explanation part is just 1/3 (at most!) of a learning cycle. Even in non-flipped classrooms, exploration and application should be happening 2/3 of time! So flipping is really just trying to offload what is supposed to be 1/3 (at most!) of a cycle. Why not take all that time and effort that go into making the videos (which should change each year), and develop better explorations and applications. THAT’s where the kids need help!! There’s a flip model called “Explore – Flip – Apply” which is what you seem to be hinting at. I was not impressed with what I saw as an exemplar of this approach. The teacher had their heart in the right place, but, like I said, the Explore phase needed a lot more work (it was really non-existent) and there was no student Invention. The video explanation for the cycle defined some terms and then got right down to a formula. I’d rather have great Explorations and Applications and use some class time for any needed DI (which can easily be adapted on the fly, in class, to student responses), than have non-specific DI video with low quality Exploration and Applications. Drat! Tone lost in cyberspace yet again. I intended the comment as further critique of the Khanian flip. You set up the argument that student exploration and abstraction are to precede teacher explanation. I was just making sure that particular pin got knocked down-that we are all clear that it’s not just where which activity happens that gets flipped (i.e. homework in school, lecture at home-such is the popular meaning of “flip”). It’s not just that, it’s that teacher explanation now precedes even the possibility of student exploration. Which I think is an important application of the framework you’ve set up for the critique here. I’m with you, man. Once teachers are flipping en masse, it’s gonna be even harder to move ’em in the direction we’d like. I will empirically second Frank’s objection (sub) to your objection re the spirit of “flipped” vs the actual implementation. You, of course, are correct that flipping should give students the opportunity to independently develop new reasoning patterns prior to explanation. And Frank, of course, is correct that the explanation should be held to an absolute bare minimum, regardless of the level of flippage. The problem is that, the way an awful lot of teachers pitch and/or actually treat the flipping is: “That’s right, classwork at home and homework in class! Let that cutting-edge pedagogy go to town on your mind for a minute!” Which is, at best, not an improvement. Naturally I meant supra. It was sub when I was typing. As you note we are seeing a lot of old approaches (Instructionism) being ported to new technology and being misperceived as cutting edge. This is exacerbated by the superficial and uncritical application of big data / analytics / collective intelligence that has characterized the biggest web 2.0 successes. The result is products that do not address the nature of education or merely focus on areas with the least transformative potential; e.g. a super web 2.0 multi-choice workbook is still a workbook. Decades ago Papert and Kay developed tools that addressed the unique properties of the PC as a medium, spoke to the curriculum, and addressed the constructivist nature of education. Any idea why this branch of work has not become more pervasive? I would like to be a part of the re-emergence of this type of work, but have had a difficult time finding may groups doing work in this area or even thinking in these terms (?). Khan Academy folks are saying/implying the EXACT same thing as you are. I have tried to collect as much material on Los Altos project and I find that the teachers there are also trying to do the same. If you listen to the latest talk by Salman Khan at Stanford, you will find that he points out that most of their ideas have been around for decades. He even referred to himself as being of the “constuctivist” school of thought. At least it shows that he has spend time in learning about the modern pedagogical methods, and has not just sat on his own ideas of education. Again the same as what Salman Khan has been implying in all his talks. Now, it is asking too much of KA (and other folks like them) to ensure that students don’t watch videos before they do the “exploration activities”, isn’t it? The videos they produce should be taken in the spirit that they are produced: explanations and insights from someone knowledgeable. Nothing more and nothing less. I gather that most of the ideas you present have been around for several decades now. Have you considered why they haven’t been implemented yet on a large scale? There are several practical reasons, that I can think of, why what you say can’t be implemented in present day classes. I have watched videos of your class that you have posted. The thing you do are great, and I wish I had the same exposure when growing up. But when growing up I had 50 fellow students; K1 to K12! For the whole 4 years of engineering college I had 42 fellow students to content with; we had 3 such group of students each year. That is just for the my engineering field. Every experiment was being done simultaneously by at least 6 students; and we had just one shot at it. I am not putting my name here, since I suffer from disabilities that have completely wrecked my career. I am trying to rebuild everything from scratch. I can’t focus on anything for more than a minute; I am extremely shy at one moment and too extroverted the next. If I were in your class, I would not be a success. People like me need a lot of time, a lot of repetition before we “get” anything. Will you repeat the experiments several times for me? Even if you do, am I not going to feel embarrassed after asking twice? If working in groups help students, will you be willing to reassemble the whole class for each of these repetitions? This is where the importance of Khan Academy comes in: a place of quality explanations that are better with what is being done in most classes now, and in a format which allow students to go over stuff the way that best works for them. This is the best bet for allowing teachers to concentrate on the students, identify their individual troubles and then get them to do all the exciting stuff that you have pointed out. The Khan Academy exercise platform is again a tool that will help the teachers in the same. It is not intended to replace the learning methods that you put forward. It is to get the teacher to identify those students that need help; and get them to a stage where they can benefit from the hands on learning methods. The Los Altos teachers are in fact finding this out for themselves. The Khan Academy summer schools are doing many things that are similar to what you have pointed out here. They are using Khan Academy videos + platform to enable the kind of individualized attention that students need. You can find some of their materials in the Khan Academy Google Sites webpage. So Khan Academy is in fact trying to meet the challenge you have made! What is needed is not new technological innovations, but a proper integration of innovations into classrooms. Books did not bring literacy to people; books were used to make people literate. Instead of issuing a challenge you could work with silicon valley, just like Los Altos teachers are doing. I bet that in a few years time the Khan Academy exercise platform is not going to look anything like it is today, because these teachers are influencing the design now. Khan’s initial arbitrary features are slowly being phased out. In making your points you leave out a big group of people who want to learn: people who can’t make it to schools and colleges. People who had to drop out due to medical and economical reasons; people who have to work to support families at young age. Khan Academy’s videos and materials provide a base that can give them more than they can get in the current school system. They won’t get the benefits of model based learning and so on, but they will have something. I guess that in 10-20 years the Khan Academy videos + exercises can give people a better education than the current models. I want to repeat this again: Khan Academy is not just for the school going population. I will wager that Khan Academy is popular because of this category of people, which includes myself. You also forget something else: inspiring students to continue learning. His, and that of other folk’s at Khan Academy, will make people want to keep learning. Your videos are not even close to the same inspirational quality as Khan’s. And it is not your fault, but the very nature of the what both are trying to do. Your hands on learning is going to look bad on video, where as Khan is explicitly trying to make great videos. Michael Nielsen, a pioneer of quantum computation, goes on Reddit and offer to make study material on quantum mechanics.They see the potential of what Khan Academy can do; and probably also see what it can’t do. I think in 50 years time educator will still be making the same arguments as you have raised here, if they do not appreciate the practical difficulties in implementing these ideas. First, excellent post Frank. You continue to do good work – you not only supply excellent criticism you add in content so those who want to learn more, can. Bravo. To kph, many of your comments are valid – there are important reasons why the learning cycle isn’t always used. Class size and structure is an important problem – but that presents an opportunity to solve that problem rather than decide they cannot be solved. There is work underway to solve some of the problems you mention in large classes. However, you did not mention what is probably the largest problem and that is teacher knowledge. Teacher knowledge of the learning cycle (in higher education) and teacher knowledge in content areas in K-12. Creating exercises and activities of the kind Frank suggests requires a lot of extra work for K-12 teachers, both to create and to learn background. That’s why people like Frank are valuable – to keep pushing, to keep explaining, and to keep expecting better results – from teachers. IF these are better than most classrooms, our classrooms are horrible. I wanted to like his videos… but I don’t recommend things to students without vetting them first. So when a student asked me if there was a good online lesson about averages, I looked up the Khan Academy’s. http://resourceroomblog.wordpress.com/2011/07/01/average/ has what I noted. I couldn’t get past the part where he said that two plus itself times one was two. Hello. Last time I checked, 2 + 2 was four. He thinks that checking the comments and then saying something in the next video makes up for that? He also rather implied that it was the student’s fault if they misunderstood him. There are lots of people who have done better online: mathtv.com, mathvillage.info come to the top of my head. Hi. I am a new teacher, this is my first year teaching, and I really enjoyed reading your post. I have been doing research into the flipped classroom and as looking at http://www.flipteaching.com and he recommended your website for some insight to standards. But I saw your criticism of Khan Academy and wanted to check it out and really would like to employ this idea of having students explore and then invent/synthesis the information and then apply it, but I was just wondering if you had any insights on how I might use this model in a History classroom? I get how it would apply to science and math, but if this is how students think, or people in general, then how can I take these concepts and apply them to areas like history where there aren’t formulas that you are trying to discover, use, and apply? Hi Frank, fantastic resources, thanks. As you know, I’ve been working on using inquiry in my classes — letting the students inquire into the material while I inquire into their reasoning. I’ve been pulled up short by what I’ve learned — there are many reasoning skills I took for granted, and was (to be honest) devastated to find that my students found them alien. Research like what you summarize here really helps me to put those ideas in context. Maybe there should be a fourth stage in the cycle — Evaluation?? I’m trying to figure out what standards to hold myself to, and comparing my work to what others have done, to see how to improve for next time. That is, these videos came at exactly the right time. Maybe ed. research will be the next subject of Khan Academy videos?? *jk* There’s nothing that a video “about” student reasoning could do better than a video *of* student reasoning. What’s great about these as multimedia pieces is that they “innoculate pseudocontext” (Dan Meyer’s words) by showing me the raw data. PS: have you looked at any of the resources of the Foundation for Critical Thinking? I’d be curious to know your thoughts. Good piece. Insinuates a convincing and compelling point: it’s not the bells and whistles, or the gloss and glitter of edutech that’s often portrayed as the great catalysts beckoning the future of 21st century education. Far from it. It is the deeper and more urgent demands of education, and learners, that should serve as the guide for edutech’s leaders. When Education and its demands begins to lead technology a very different genre of edutech programs can come into being. Most edutech programs are still missing the point, or accommodating it minimally. Provoking critical thinking and numerical reasoning, invoking verbal and non-verbal analysis, synthesizing holistically with meaning, clear intent and purpose, all of this should be embedded in the design and structure of Math teaching/learning programs. Increasingly, it can be shown (and proven: e.g. Khan Academy videos) that edutech’s vast repertoire of techie-assets can evolve to a point where it is not “up-front-in-the-face” flaunting its entrails, but simple, discreet, and unassuming. The techie-design of edutech Math courseware needs to become as incidental and in-passing as a piece of chalk and a board. In the end, simplicity is the highest expression of complexity. Content that is penetrating, insightful, and with enough reach to stimulate thinking and turn minds, is destined to win the hearts and minds of our learners. The thirst for knowing and understanding is spreading swiftly, like famine, across the globe. The ideas driving the design and development of Mathematics courseware ought to go beyond the prevailing impulse to dazzle minds with edutech’s ability to wow its audiences. “Wow!” responses often prove to be transient and shallow, and leave in its wake, the darker shadows of unchanging landscapes. And evoking “Wow!” responses doesn’t teach anyone to become better thinkers or doers. Just more expressive cheerleaders spreading the feel-good thing. I’m a student at the University of South Alabama inspired to become an elementary teacher. I enjoyed reading your post and it made me think a lot about the way I will teach in my class. I am not completely tech savvy but I do find that technology increases my learning. I’m a full time student with a part time job, I have an extremely busy schedule and half of my classes are online. I strongly dislike the online classes because I feel like I am not learning anything just simply doing busy work. I understand topics better when I am around people and can have conversations. I agree that some online programs give students the freedom to create and figure out topics themselves, but not every subject should be taught from a computer. When students are creating projects and they have to find all the information themselves that’s when they learn the most. By creating fun projects and games it makes learning enjoyable. Traditional learning can be extremely boring sometimes. It’s hard to focus when your constantly listing to a teacher talk about something you can care less about. By interacting, we engage ourselves in the subject and want to know more. Since K5 I have always received instructions on what to do and how much to study for the text, constantly receiving instructions. I have mixed feelings about this technology teaching. I know from experience that finding my own information to create a project, furthers my knowledge about the topic. I have enjoyed reading your post, and I can tell that you are an amazing teacher. Great discussion. It would be nice to see more ed tech projects based on learning science research. Not just the learning cycle, but other findings as well. Formative feedback is an example. It’s largely missing (AFAIK) from KA and similar flipped approaches. There are multiple choice questions and such, but that’s not much use (in the general case) for improving formal reasoning. A central problem is that formative feedback takes instructor time. Lots of time, if done frequently. The tech response has been to try to have computers give feedback. The problem: computers cannot give formative feedback. They are not smart enough. An alternative approach is to rethink how humans give formative feedback. Streamline the process. Perhaps allow feedback to be outsourced. This is one part of an approach I’ve been working on for a few years. The project did NOT start with tech, and ask, “How can this help with learning?” I started with learning science, and use tech to support human learning processes. I’m starting to make the tools available to other people, at http://flippedtextbook.com. In my school, over 50% of my students have no internet access from home. IMHO, the “flipped” classroom is just like assigning reading the textbook ahead of time ( really? What % of my kids do you think actually ever do that) with the added “benefit” that it has hidden the book from half the class, and the students aren’t improving their reading skills. In reading the biography of Lewis Carroll, it struck me that the geometry and logic he was tutoring at University was the same material that we now apparently expect “all” high school students to master on the first time through. We must be mad. Brain evolution is not going to change our neurobiology in 7 generations. Sadly, pretending and passing students along is what we are left with. The flipped classroom versus….what? The conventional „unflipped“ chalk-and-talk classroom (Type A)? Or the progressive „unflipped“ classroom where project-based exploratory activities are combined with interactive math learning software (not Khan’s) provoking investigative approaches (Type B)? Teachers and educators from both Type A and Type B schools debating their view-points about flipped classrooms, may find themselves talking over each others’ heads. If the Khan videos and the concept of flipped classrooms were applied to both types of the clssrooms (A and B being converted into Khan’s flipped classrooms) and it improved students’ Math performance significantly then clearly there is much to be said for it. Contrast that with some other Math learning digital courseware (not Khan’s) used in flipped classrooms, that does not improve students’ Math performance significantly. What would that suggest? Surely it is not just the notion of flipped classrooms but also the kind of Math learning Courseware being used in them, that influences students’ performance. Possibly far more significantly than Type A and Tybe B ones running independently as „un-flipped“ and without Khan’s videos. One could argue that what makes the flipped classroom successful in terms of students’ performance is the use of screen-oriented Math learning programs such as Khan Videos. Correct me if I am wrong, but flipped classrooms were around long before Khan videos made their impact. There were teachers trying them out with other learning courseware. It was not until Khan came along with his videos that the classroom “flipped“ almost on its own, with sensational results. The flipping was provoked by a courseware that transplanted “teaching Math“ by the teacher with “learning Math“ by the student. For the first time the courseware (Khan videos) replaced the teacher’s conventional teaching role by doing the actual (conventional?) “teaching”. So in another sense, the flipping of roles provoked the “flipping” of the classroom. The primary cause for flipping to be successful, can be traced to the design and content of the courseware used to “flip”, and not the consequence flowing out of its use (the act of flipping itself). My name is Ashley Phillips and I am a student at South Alabama taking EDM310. I completely agree with interactive classes overtaking the traditional ones. I believe that children learn more efficiently in a active class for them to engage in the learning cycle. The children should have the opportunity to explore their options rather than rote memorization. Interesting and informal post. I can’t imaging that anyone would argue against better reasoning skills leading to more learning, on average. But isn’t this at least in the same ballpark as saying more intelligence leads to more learning? I completely agree that we need more curriculum that requires reasoning skills. This might well result in students being quicker to use the reasoning skills that they do have as opposed to being passive and waiting for answers. Actually improving reasoning skills I think is a much more complicated issue. A kid that scores 500 on the SAT math can improve their score a bit through test taking techniqures, but they will hit a wall at some point due to the difficulty of improving their reasoning ability – even when limited to a very specific sort of reasoning. As far as I can tell from your piece, Frank, you’re using the word “disruptive” to basically be a synonym for “radical change.” And, using that definition, you’re right to point out that technologies that are supposed to disrupt education aren’t really doing that, because they’re not offering a vision for radical change, at least not one that’s attractive. The radical change they’re offering can even sometimes lead to worse educational outcomes. When I hear ed tech people talking about disruptive innovation, this is what I hear. I hear people saying that their innovations are ways of making the low end cheaper and easier to use. And OF COURSE the old guard will ignore these tools. After all, that’s what happens in industry after industry in the face of disruptive innovations. At the current time, Khan Academy is a collection of lectures (following textbook material) that students can listen to multiple times to reinforce learning. It provides a great value to all students, specially to those who are not good auditory learners. It does not teach critical thinking skills. It may be altogether different and more powerful in 10 years but too late for a whole generation. As a Los Altos resident, the teachers (with the exception of a few) in the district are comparable with any other school district in the state. No better or worse. There is a tilt toward using technology in the classroom, most of which are related to tedious learning ‘drill’s that student will tire easily. It is good help for kids to be able to practice their learning facts in a play based approach, but nothing more. As a software engineer who has worked in education for 20 years, I agree that many educational products are not helpful. But I’d say it’s not for a lack of trying, it’s more a lack of understanding. So it’s good blogs like yours are pointing out where we are getting things wrong. Speaking of the Learning Cycle, I’ve recently discovered Process Oriented Guided Inquiry Learning (see pogil.org) which is a method of instruction for high school and college based on the Learning Cycle. I’ve visited a classroom using it and I think it’s fantastic and I wish it existed when I was a kid. There is almost no lecturing from the teacher—instead students gather in groups to analyze a situation, answer questions that guide the group to think about the situation, explore aspects of it, invent a generalization for the phenomena, and then apply it simple exercises and then more complicated problems. I.e. the students are guided through the socratic method through the learning cycle. Another friend of mine pointed me at modelinginstruction.org for physics which is also a method of group inquiry, similar in many ways to POGIL. They have a nice innovation of having each group use a hand held white board around which the group can interact and help them coalesce their thoughts.